The first students of École Polytechique’s Data Scientist Chair are starting out into the job market. École Polytechnique launched the Chair at the end of 2014 in partnership with Keyrus, Orange and Thales. Keyrus and its partners, Orange and Thales, have made public the assessment of the 2nd year of activity of École Polytechnique’s Data Scientist Chair. In total, more than 250 students, of which more than 100 attended the Ingénieur Polytechnicien program and over 150 specialized in Data Science during their 2nd-year Master's in Mathematics and Applications, benefited from some of École Polytechnique’s Data Science Chair lectures. The current explosion in the amount of data has unquestionably made Big Data (or Megadata) one of the major economic and organizational challenges companies have to face. According to the firm Transparency Market Research, revenues from the Big Data market are expected to grow by up to 40% and to increase from 8.9 billion dollars in 2014 to 24.6 billion dollars in 2016. The market needs high-level specialists capable of grasping data, right from their collection, through their classification and analysis, to their storage, so as to make sense of them and create value from them, and, in so doing, generate new sources of lasting growth. Since the Data Scientist Chair was launched in October 2014, many students and student-engineers from "grandes écoles" have benefited from training courses of excellence supported by this Chair. The Chair aims to support training in data science applied to Big Data through 2 courses: a 3rd-year course within the "Ingénieur Polytechnicien" Program, and a 2nd-year Master's course that was initially jointly approved by École Polytechnique and Télécom ParisTech, and which is now under the auspices of Paris-Saclay University. In addition, a particularly innovative on-the-job training program in data science, named "Data Science Starter Program", was created at the same time as the above-mentioned training programs. It helps working professionals develop their expertise in Big Data and Data Science. This continuing professional development program has met with absolutely remarkable success, which is borne out from one training session to the next. 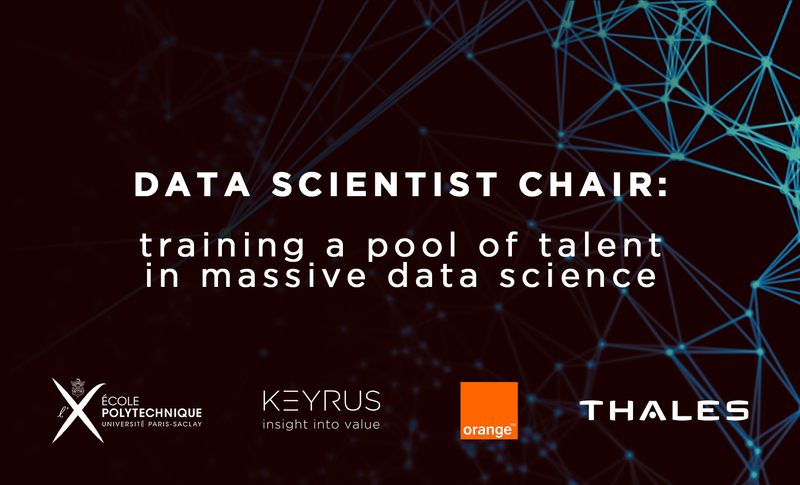 Through this teaching and research Chair, the industrial partners Keyrus, Orange, and Thales are showing great interest in the young graduates from École Polytechnique's massive data science stream. Moreover, these partners are also offering placements and jobs matching these academic profiles. Jacques Biot, President of the École polytechnique, expresses his delight: "At the work accomplished with the partners. The Data Scientist Chair has played a large part in the establishment of training courses of excellence that produce a pool of graduates ready to meet the challenge of analyzing, utilizing, valorizing, and securing massive data. We are pleased to observe that the appetite of our students for this promising sector is being borne out, and that the support provided for these training programs now meets companies' recruitment requirements." Bruno Teboul, Senior Vice President, Science & Innovation at Keyrus, comments: "We are very pleased with the work accomplished and encouraging results produced through the establishment of the Chair. At the same time, we are proud to be involved and committed to the cause of Big Data and Data Science, alongside our partners. We are also playing our part in directly developing the Big Data and Data Science field in France by training expert Data Scientists and Computer Scientists, whilst also recruiting some of them to work on our projects or sending them to join our clients' Analytics departments." For Marko Erman, Director of R&T at Thales: "Big Data play an increasingly significant role in the systems and services that Thales proposes to its clients. To take these solutions forward and assist our clients with their digital transformation, it is essential to develop Data Scientist skills. The establishment of the Data Scientist Chair encourages students to develop careers in this ever more sought-after discipline and trains them in it. It is thus fully in line with Thales's strategy and requirements." Henri Sanson, Head of Data and Knowledge Research at Orange, adds: "We are very pleased with the work accomplished with the Chair, as much with regard to the initial training of high-level young graduates as to the on-the-job training, which enables us to train several dozen of our employees each year. Big Data constitutes a key issue in technical and economic performance, and for this reason we are bolstering our teams of operational Data Scientists as well as our research teams, which are in fact world-renowned on the subject." École Polytechnique is the leading French institute which combines top-level research, academics, and innovation at the cutting-edge of science and technology. Its various undegraduate and graduate-level programs – Bachelor’s degree, Ingénieur Polytechnicien, Master’s, Graduate Degree, PhD program and PhD– are highly selective and promote a culture of excellence with a strong emphasis on science, anchored in humanist traditions. As a widely internationalized university, École Polytechnique offers a variety of international programs and attracts a growing number of foreign students and researchers from around the globe (currently 30% of students and 39% of faculty members). Orange is one of the world’s leading telecommunications operators with sales of 40,9 billion euros in 2016 and 155,000 employees worldwide at 31 December 2016, including 96,000 employees in France. Present in 29 countries, the Group has a total customer base of 263 million customers worldwide at 31 December 2016, including 202 million mobile customers and 18 million fixed broadband customers. Orange is also a leading provider of global IT and telecommunication services to multinational companies, under the brand Orange Business Services. In March 2015, the Group presented its new strategic plan “Essentials2020” which places customer experience at the heart of its strategy with the aim of allowing them to benefit fully from the digital universe and the power of its new generation networks.